The call was only seconds old – a partial introduction still warming the airwaves – but as soon as I mentioned the magic words, Wallsend Boys Club; with enthused vigour Eric Steele was off and proudly running through a world – his world – of growing up on North Tyneside. An engineer with the Gas Board, Eric’s father began his working life as an apprenticeship with shipbuilders Parsons; his mother worked as a government officer at the DHSS. “Working hard was the norm.” Eric explained “You’d work hard first, then maybe, you might be accepted.” Despite the successes he’s since enjoyed, it’s a mantra he readily admits he lives by today. As sport mad children, Eric and friends would frequent the local boys club at Willington Quay for both entertainment and experience. It wasn’t just football on offer but, clearly that was the big draw for young Steele. It was also at Willington that he first met Peter Kirkley. As Willington was more focussed on indoor pursuits, in 1968 Kirkley moved his footballing aspirations up the road to the Wallsend Boys Club. Both he and Eric told me he “took his boys with him” but there is also a clear indication that they all followed him freely and donned the new town colours. Whilst Peter would avoid such tributes, his vision and what happened subsequently has shaped the face of football in the region forever. 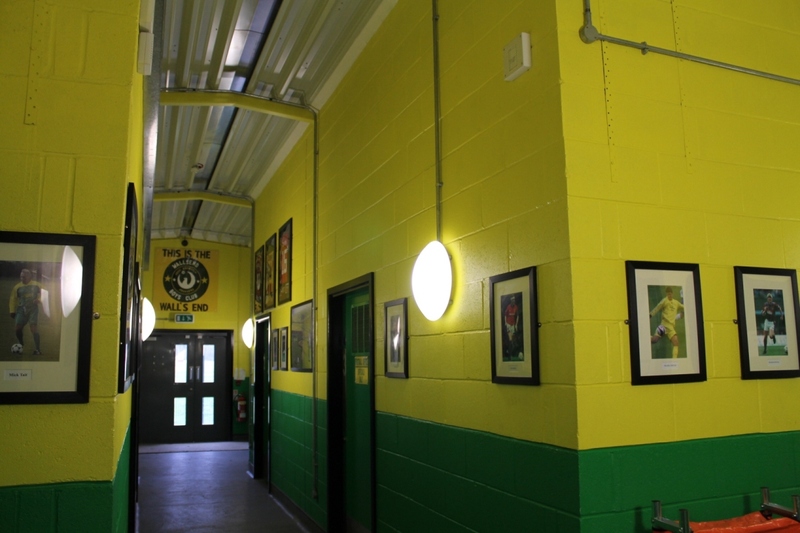 The club’s ground rules have even helped form the national Respect campaign. “Not good enough” to play himself, Peter told me his simple philosophy was “just to give the lads a game”. He wasn’t interested in running the club, “only in the football side, the coaching”. 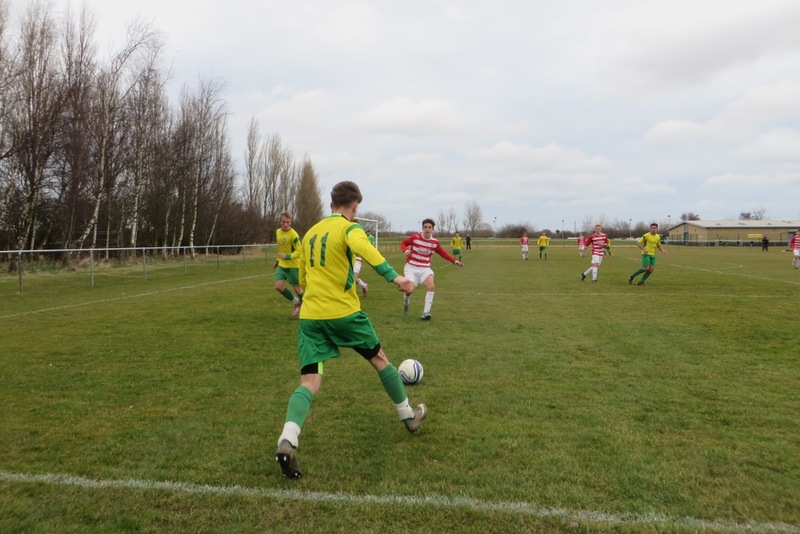 Whilst the club centred in Wallsend, the football teams played out on numerous borrowed pitches. As its popularity increased, very soon it was clear he was soon going to need more help to steer this great ship. Six years later construction worker – now Vice President – Sid Sharp bought both into the vision (and more recently the house next door to Peter). 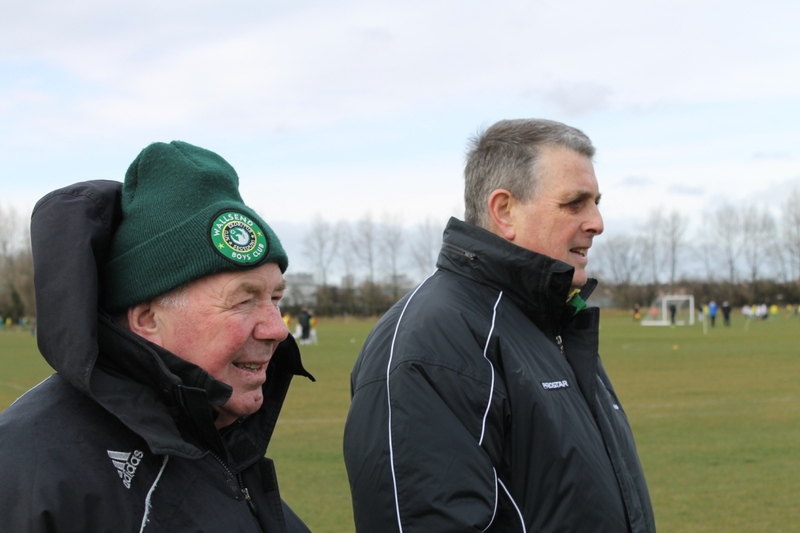 Forty years on, watching these close friends strolling round the pitches, it’s hard to imagine a more unassuming pair. Taking a close interest in each and every game; no player, coach, or parent of any team present is denied a friendly welcome, a passing comment, a chat about life both in and outside the club. They quite nonchalantly told me how Dennis Tueart had “popped by” last week and Gazza the week before; leaving Peter six hours later, I somehow doubt I was treated any better or worse than either. In Rheydt Avenue everyone is made to feel equally important. 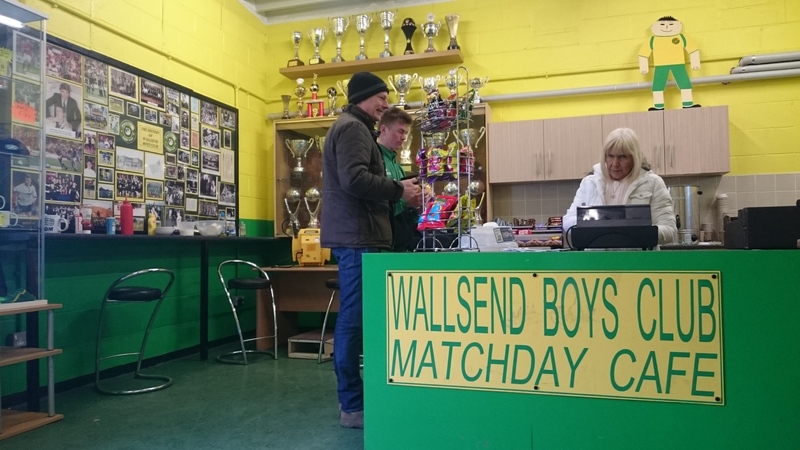 At Wallsend, the club comes first. Its sole aim is to provide and outlet for boys – any boys – and to foster an environment in which they might succeed in the beautiful game. “We had three teams when I started” Sid explained “Now it’s twenty three. This is our life.” The incredible alumni are testimony to their endeavours. Countless professional players have come through Wallsend. Beardsley, Bogie, Bridges, Bruce, Campbell, Carrick, Cavener, Chapman, Clark, Dinning, Evans, Fenton, Forster… the list is breathtakingly endless… Sealy, Shearer and of course both Eric Steele and Les Taylor. With the total backing of the community, the foundations are so strong that there will undoubtedly be many more. Going to this footballing Mecca, I just felt l honoured to have been welcomed through the gate. Given the locality, Club President, Kirkley was also quick to clarify any misconception that they were there to serve Newcastle United. Wallsend Boys Club is proudly independent. Sid added, “All clubs are welcome here, as long as they contact us correctly.” When clubs do show an interest, with almost a Corinthian spirit, teams are driven wherever they are needed to showcase the boys’ talents. 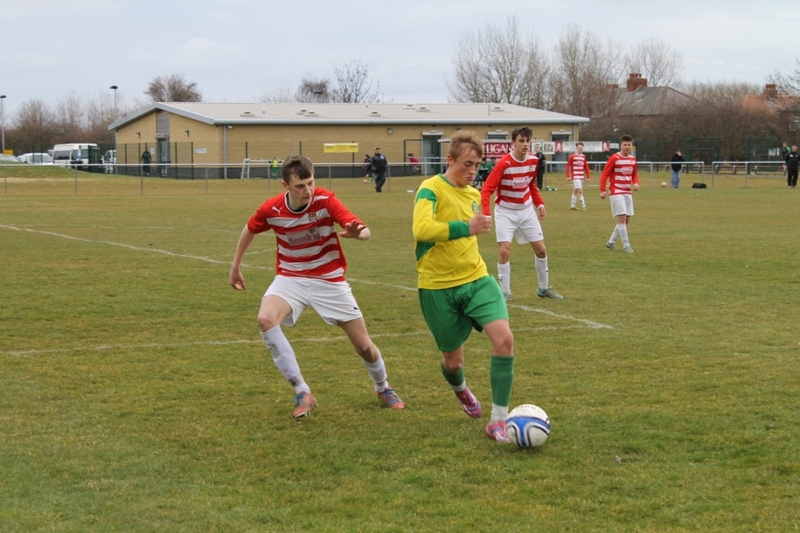 Yesterday, the U16s had gone to Edinburgh to face HIbs; today local rivals stood between them and the Cup Final. By the age of eighteen, Steele was playing for his Burnside High School, Wallsend Boys Club and the England School Boys. Probably most importantly he was also already coaching at Wallsend. I’d arrived early to ensure a parking space. Behind me a consistently steady stream of vehicles pulled in, dropped off or parked up, and green and yellow clad offspring bounded from within. The sun was out, the mood was light. Whilst the U16s Cup Semi kicked off at 10am, out on the pitches countless youngsters were already warming up. Each weekend it’s the same. The young development sides train on a Saturday morning, followed by the “Seniors” in the afternoon. 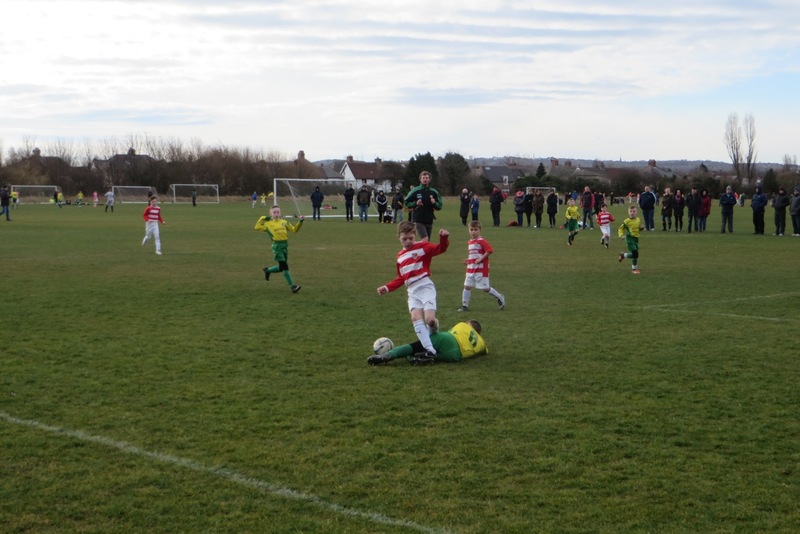 On Sundays, numerous U9s to U16s are shoe-horned into the pitches. On this day, eight games in just five hours had to be staffed and coached with goodwill. 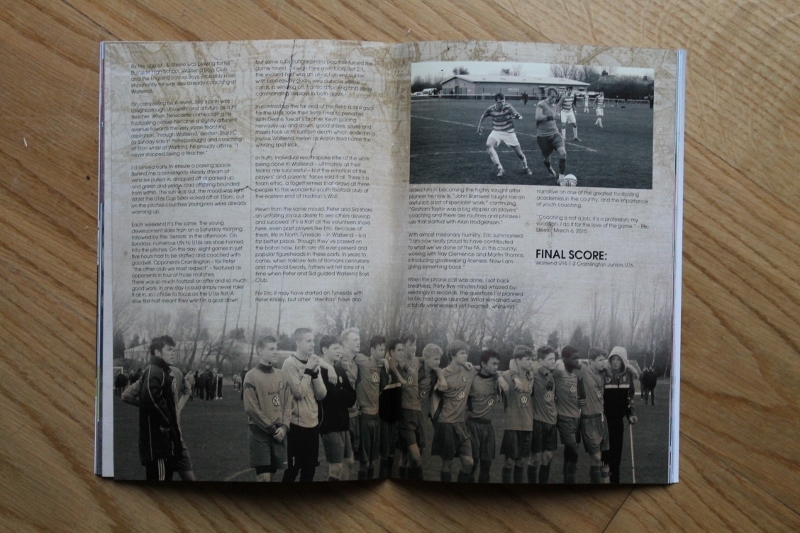 Opponents Cramlington – for Peter “the other club we most respect” – featured as opponents in four of those matches. There was so much football on offer and so much good work, in one day I could simply never take it all in, so I chose to focus on the U16s first. A slow first half meant they went in a goal down but some substitutions and a pep talk turned the game round. Though they eventually lost 2-1, the second half was all action encounter; with breakaway goals, very dubious yellow cards, a sending off, frantic attacking and some commanding displays in both goals. 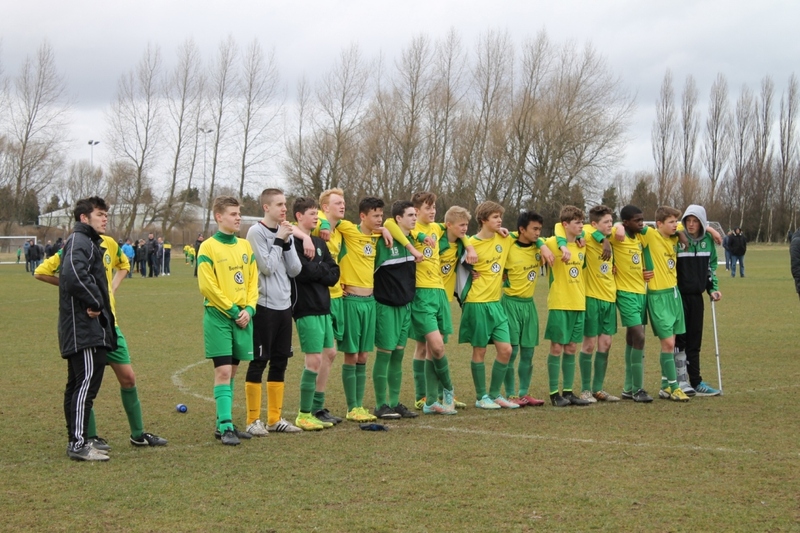 In contrast up the far end of the field, a late goal for the U15s took their Semi Final to penalties. With Dennis Tueart’s brother Kevin pacing nervously up and down, good strikes, saves and misses took us to sudden death which ended in a joyous Wallsend melee as Aaron fired home the winning spot kick. 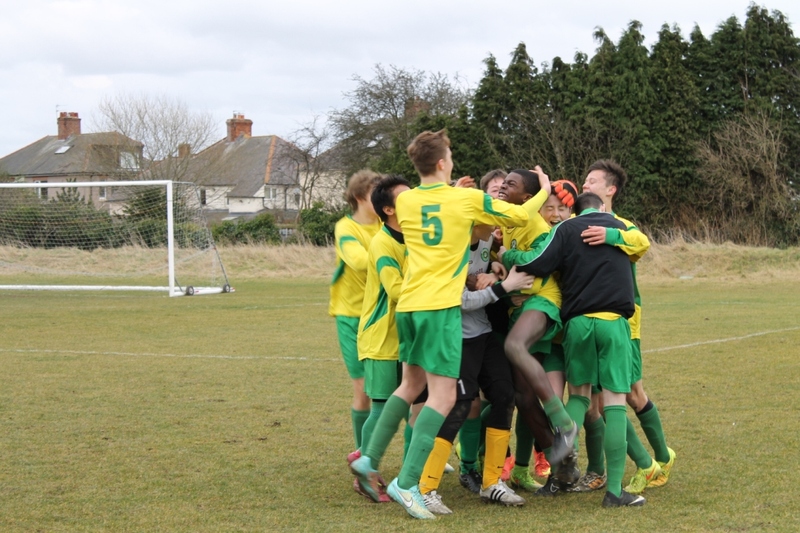 In truth individual results spoke little of the work being done in Wallsend – ultimately all their teams are successful – but the emotion of the players and parents faces said it all. There’s a team ethic, a togetherness that draws all these people to this wonderful youth football club at the eastern end of Hadrian’s Wall. Hewn from the same mould Peter and Sid share an unfailing joyous desire to see others develop and succeed. It’s a trait all the volunteers share here, even past players like Eric. Because of them life in North Tyneside – in Wallsend – is a far better place. Though they’ve passed on the baton now, both are still ever present and popular figureheads in these parts. In years to come, when folklore tells of Romans centurions and mythical beasts, fathers will tell sons of a time when Peter & Sid guided Wallsend Boys Club. When the phone call was done, I sat back breathless. Thirty-five minutes had whizzed by, seemingly in seconds. The questions I’d planned for Eric had gone asunder. 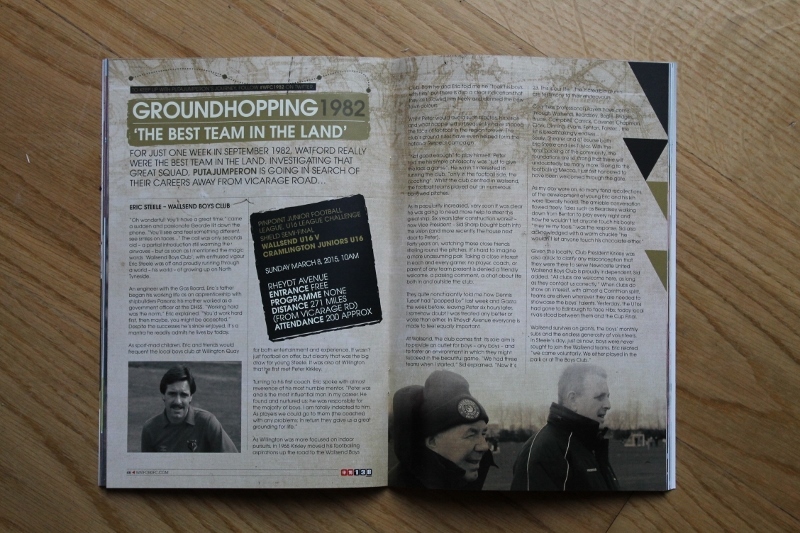 What remained was a totally unrehearsed yet heartfelt, whirlwind narrative on one of the greatest footballing academies in the country and, the importance of youth coaching. This entry was posted in #WFC1982, 2014-2015, Pinpoint Junior Football League and tagged #WFC1982, Alan Hodgkinson, Cramlington Juniors, Cramlington Juniors U16, Dennis Tueart, Eric Steele, Graham Taylor, Hadrian's Wall, John Barnwell, Martin Thomas, Newcastle, North Tyneside, Peter Beardsley, Peter Kirkley, Pinpoint Junior Football League, Ray Clemence, Rheydt Avenue, Sid Sharp, The FA, U15, U16, Wallsend, Wallsend Boys Club, Wallsend U16s, Watford FC, Willington Quay. Bookmark the permalink.